Ballpark Basics: A classic downtown ballpark whose design is standing the test of time. Ballpark Breakdown: Baseball America called it one of the best ballparks in 1999, Sports Illustrated called it the best minor league ballpark in 2001 and not much has changed since then. 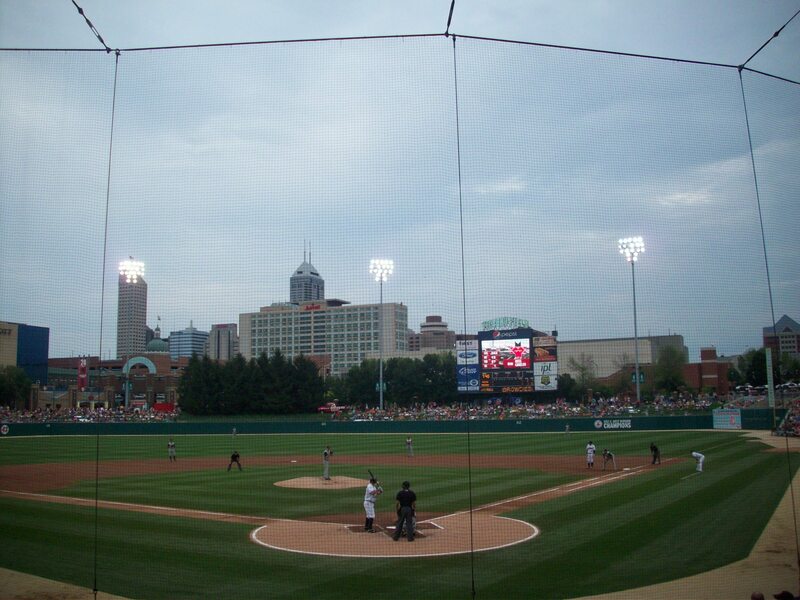 Built in downtown Indianapolis in 1996, Victory Field is a sterling example of how a ballpark can help make a downtown transform. 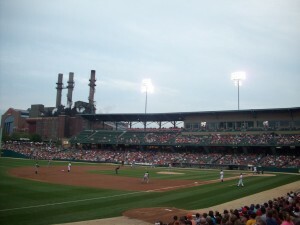 The ballpark is part of a larger sports complex that encompasses a number of blocks downtown and included Lucas Oil Stadium, home of the Indianapolis Colts, and Bankers Life Fieldhouse which is home to the Indian Pacers. The location of so many teams in such proximity helps keep the need for monstrous sized surface lots at a minimum, and keeps people coming to the downtown area year ’round – a fact that the numerous restaurants and shops within a short walking distance are happy to attest to. This second incarnation of Victory Field got its name from its predecessor. 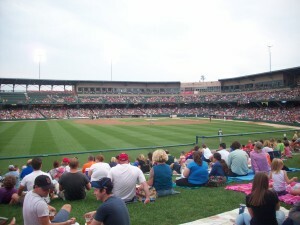 Though the former home of the Indians started out as Perry Stadium after its first owner, the name was changed to Victory Field during World War II. It was then changed a third time to Bush Stadium in 1967 in honor of Donnie Bush, a major league ball player from Indy. Since the Indians moved into their current park, the original location has been redeveloped as apartments and we recommend a trip to see this innovative repurposing of the former ballpark. …and didn’t make it very far. After walking by the berm seating that wraps around the entire outfield wall we ran into the Sun King Sun Deck. While small in size it is mighty in appeal. Here there is a Sun King specific concession cart, conveniently charged with distributing beers only from this local brewery. 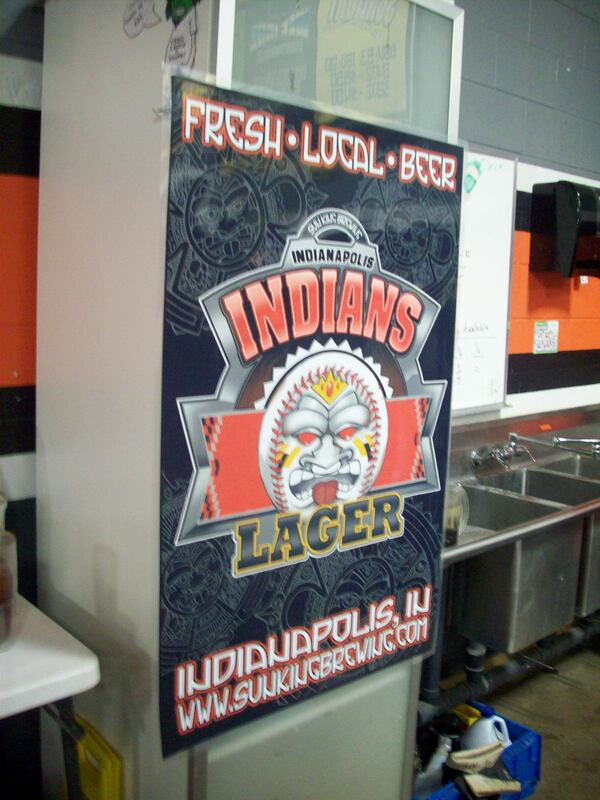 Although they had several styles for sale, our group decided on the Sun King Indianapolis Indians Lager since Victory Field is the only location it is sold. after making our selections, we found a spot at one of the hi-top tables that overlook the left field wall, providing not only a great view of the game, but some excellent people watching as well. We ended up staying here for much of the game instead of our seats. When we did eventually peel ourselves away from Sun King Sun Plaza, we continued to work our way around the park. Situated in the left field corner is the Captain Morgan Cove; a large bar with tables on a tiered platform. Here you will find the most expensive seats in the house at $35, however you get a $10 voucher for food and drinks in the bar. By the looks of things on this Friday night this is a very popular seating option. 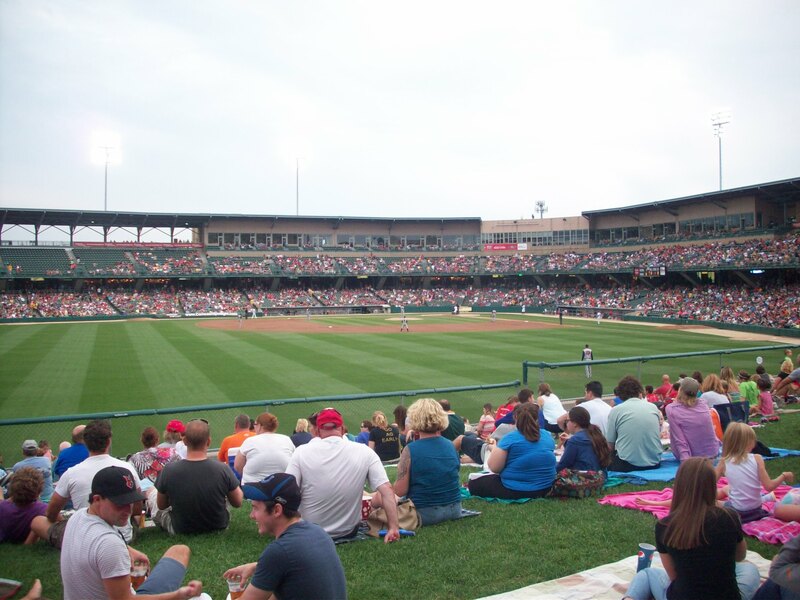 With seating for over 12,000 with a large lower grandstand and a small upper deck along with 28 luxury suites it is really surprising how cozy Victory Field feels; we walked the entire ballpark and there really wasn’t a bad seat in the house. The park’s concourse is wide and open to the action on the field and there are also many opportunities to watch with a group. On top of the already mentioned berm seating and Sun King Sun Deck, there are also picnic areas in the right field corner along with a party terrace on the second level on both the first and third base sides. There is a more secluded picnic area in the left field corner but this is further away from the action on the field. Another nice touch is the banners to famous former players. Having had a number of different affiliates, the Indians have had their share of future stars including Harmon Killebrew, Roger Maris, and Randy Johnson. When sitting on the third base side you get one of the most unique views in all of MiLB. Right behind the ballpark is the Citizens Thermal Energy steam plant. Huge smoke stacks tower over the right field corner and steam billows out of the stacks throughout the game. Behind the plant the home of the Colts, Lucas Oil Field, is another major landmark visible behind the outfield fence. 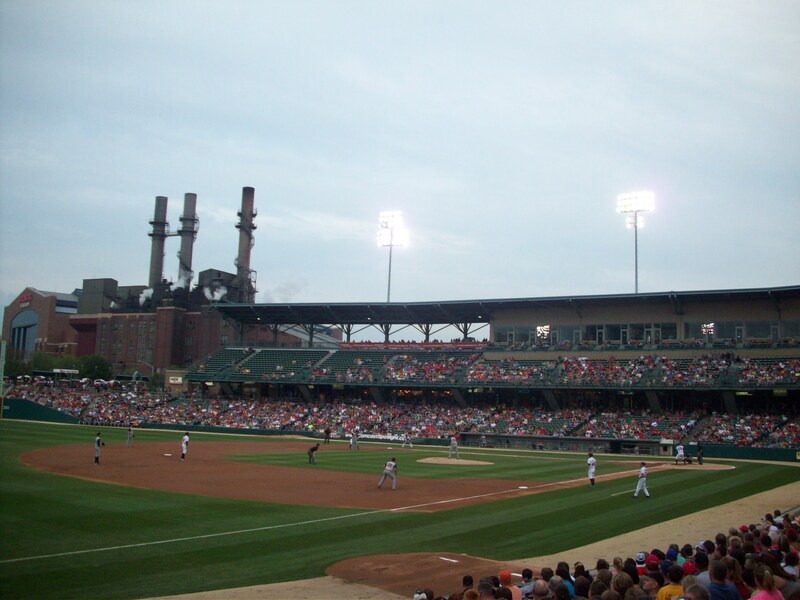 Indianapolis has a proud sports history from its high school basketball all the way up to its professional sports teams. The Indians and Victory Field add another chapter to this proud story. 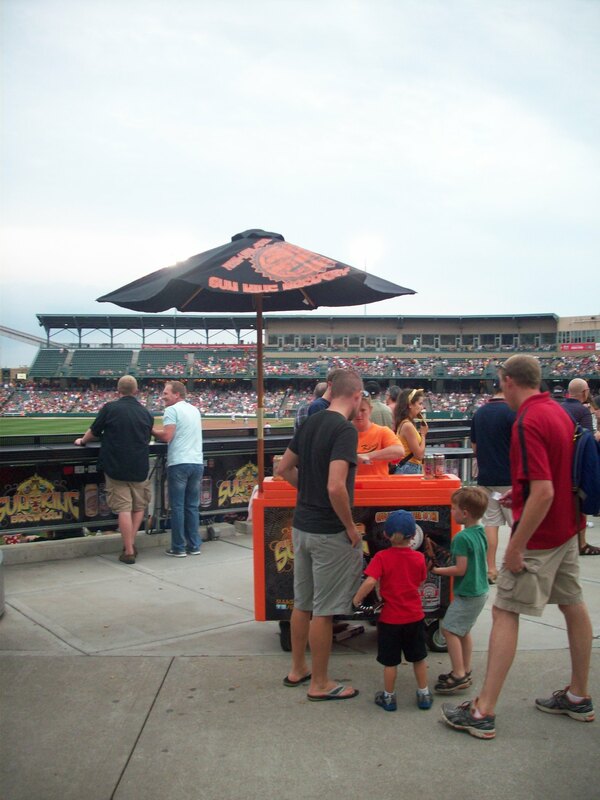 We are lucky enough to have family that just moved into town so we are looking forward to many more visits (and many more cans of Sun King Indianapolis Indians Lager!). Brew Basics: Who needs paid advertising when you have word of mouth? A big barn like structure with cement floors and no sound proofing might be a surprising spot to find a large group of Indianans (Indianapoli? 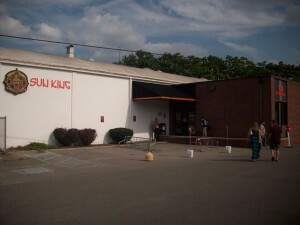 ), but when the barn like structure belongs to Sun King, that’s where they’ll be. An enterprising start-up brewery with a Hawaiian theme, Sun King spends very little on marketing because they don’t have to. A “try it, you’ll like it” approach, fans who are more than willing to go with word-of-mouth and ingenious sales tactics (Half price growler fills every Friday) do all the marketing for them. Their baseball connection is obvious, and another great marketing scheme. Most breweries who manage to get their foot in the door at a local stadium do so through their distributor and start out on one tap. 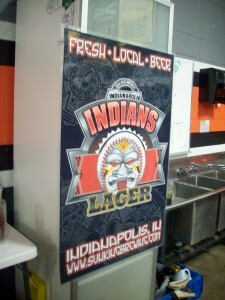 Sun King got their foot in the door by brewing one for the team – the aptly named Indianapolis Indians Lager, is sold exclusively at the stadium. The warehouse that Sun King calls home is basically a one stop room. 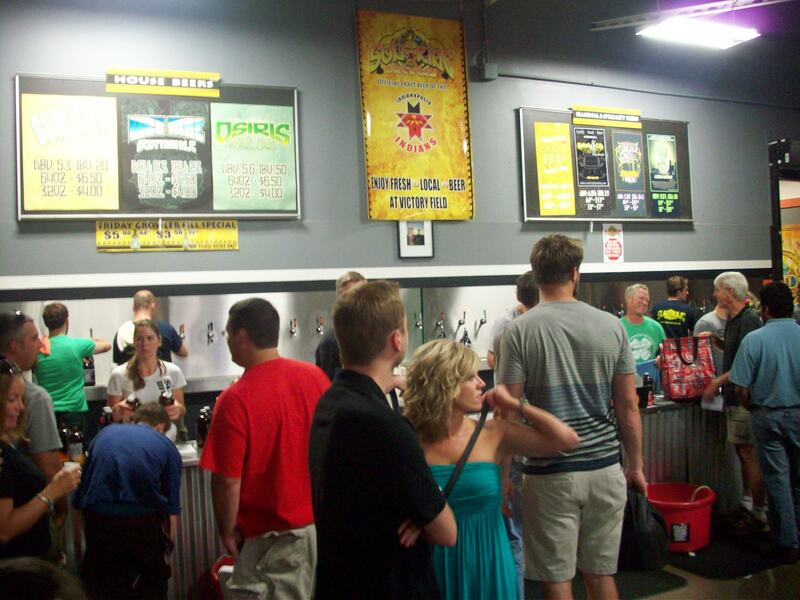 There are two counters for perusing and purchasing merch, a large growler fill station under an even bigger chalkboard that gives all the details about what’s on tap, 6 silver stand up tables (wear comfy shoes!) and a bathroom with shower, should you be so inclined. It’s here also that two tasting stations are assembled during their tasting sessions and the beers pour almost as fast as you can drink ‘em. They host all kinds of events including movie nights and even have a live bands on weekend evenings. Kolsch 4 Life (4.8% ABV/ 21IBU) A big wheat beer with banana and bubblegum malts which only increase in the sip and are very strong by the end. The aroma doesn’t hide any of the malty wheats and gives you a hint as to what you’re in for. The Kolsh was basically the same color as the Cream Dream and the Firefly Wheat, which is to say it’s a typical pale yellow lager color with maybe a little peachiness (in color, not flavor). Firefly Wheat (5.3%ABV/24.5 IBU) Wheaty, lager color but not white wheat. This one didn’t have a very strong flavor, to the point that while it can’t be classified as watery, it was close. Very light palate, aroma and minimal carbonation. A good beginner beer. Shake Up (3.01 ABV/18 IBU) Holy floor cleaner Batman! This one is peachy colored, smells orange, tart and a bit like Mop ‘N Glo. Strong orange flavor that wasn’t bad but wasn’t their best either. In general it’s hard to get past the smell of this one to actually give it a fair shake. Wee Mac (5.3% ABV/23 IBU) – Tony’s go-to. This beer is a pretty cherry-wood color with lacing. It’s malty and a little bit smoky in the aroma, and the taste reflects this as well with light malts that turn to hints of coffee and smoke and finish a bit cola in the aftertaste. In our experience, this beer is the most likely one that a restaurant might have if they have Sun King on tap, which is great because it’s our favorite. Osiris (5.6%ABV/50 IBU) – Hoppy and a touch wheaty in the aroma and that holds true for the palate as well, as the wheat and hops are the most pronounced flavors. Without a bunch of spices or other add ins to dilute the flavor, the Osiris a traditional wheat beer that starts as a light and sparkly wheat and ends dry and hoppy. Sunlight Cream Ale (5.3%ABV/20 IBU) – Not the best first impression with the this one as it actually had a weird spoiled smell that was hard to place. It had a light yellow coloring and just a bit of lacing. The Sunlight starts with a hint of banana malts and finishes slightly bready with light carbonation. Cream Dream – Not what we expected. Though the name brings to mind root beer floats or carmel buckeyes, but this is actually very hoppy beer and surprisingly little creaminess. It is fairly smooth on your tongue with a light flutter from the carbonation. A hoppy start gives way to a tart, citrus middle and a clean finish. It’s very strong, we were all startled by it at the our first sip, especially the bitter hop aftertaste.